As you can see, we're a bunch that likes to have fun. From playing on the floor with little ones, trudging through the mud for amazing senior portraits to climbing through wheat fields for perfect family portraits. We do it all. As a family business we think of our clients as more than customers, we feel they are life-long friends and that have been blessed to be invited into their lives to capture their precious memories over the years. We love the fact that as photographers we get to capture not only milestones, but the journey from the tiny newborn we first meet to the amazing adult they become as high school seniors and the wonderful families they share with us as they grow. When you choose Starlight you'll get not only one but three artists that work to ensure the most amazing portraits possible, from start to finish. 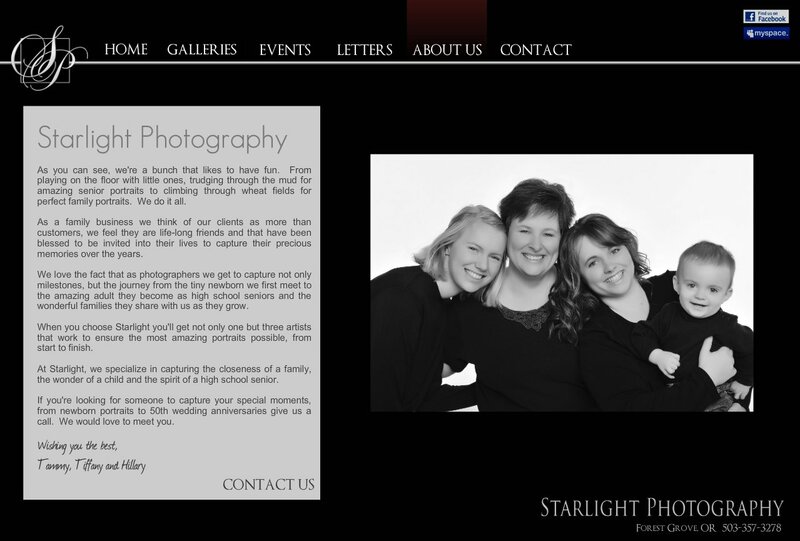 At Starlight, we specialize in capturing the closeness of a family, the wonder of a child and the spirit of a high school senior. If you're looking for someone to capture your special moments, from newborn portraits to 50th wedding anniversaries give us a call. We would love to meet you.